I agree to pay the reservation deposit ($ 124.9) for this order. Prime 1 Studio is thrilled to introduce the 1:4 scale PMDCIJ-05: Darkseid from the one of the Best Fighting Video Game “Injustice 2”. Darkseid is a DLC villain and the Bigger Bad of the game. He is the devil incarnate, the lord of Apokolips, and a father of his deceased son Kalibak. Darkseid arrived on Earth because Superman killed his son and to go after the Anti-Life Equation held by Wonder Woman. He has many abilities like his comic book version. His ability Omega Beams is an ultra-powerful attack to strike his opponents down, not to mention that summoning Parademons, and teleportation can knock his opponent's clear across the screen. 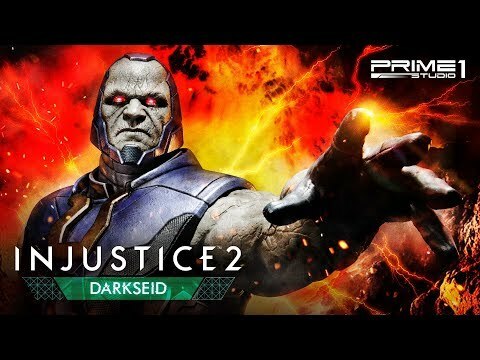 PMDCIJ-05: Darkseid statue embodied a lot of concepts of the Injustice 2's character. Moreover, collectors can choose from two display options which one of them is the classic and iconic pose that folding his arms behind his back. Another exquisite and bloodcurdling detail that embodies the character is the likeness. The Exclusive Edition of Darkseid includes an alternate angry portrait. Don't miss your chance to add the God of Apokolips into your collectibles.